Piazza San Pietro, Roma, and beyond. I cannot get beyond this city, it calls me all the time. Sigh. Yes, me too! Not nearly as good of a camera as this. I hadn’t been to Rome in about 10 – 12 years… much too long. I love that history lesson, thank you, Dino, I didn’t know. So true to Italian form, LOL. I agree, I think the basilica is much more disarming when you come round the corner and suddenly see its full glory right in front of you. Ouch, just re-read my post… some serious typos, surprised you could even read it! 🙂 I think I’ll blame my iPhone and my terrible eyes. 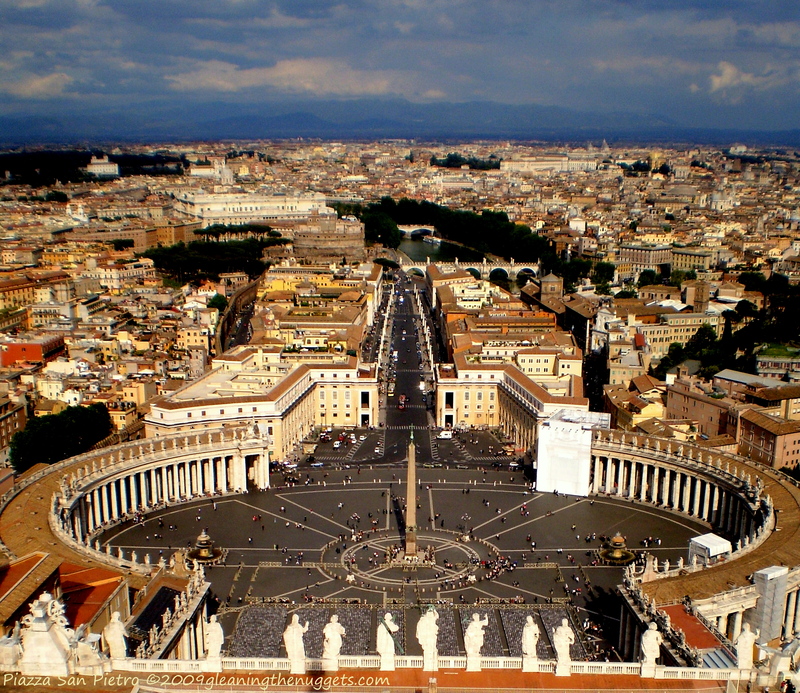 I have a pic almost identical to yours, I must find it… and also one taken from the opposite side of the dome, overlooking the very swanky Vatican gardens! I didn’t notice any typos, Dino, they are usually more obvious to us when we read what we write afterwards 🙂 Yes, the Vatican gardens are so lovely! Maybe I’ll post one of those next…we can never get enough of Rome’s splendor. A gorgeous day captured in a glorious city – thanks for visiting! Stunning photograph. What is your book about? Noelle McDougall traveled the world as a young girl, from the Middle East to the Mediterranean and beyond. But instead of finding herself, she got lost along the way. As she grew, boys and babies only made life more complicated and confusing. At age 33, she met her dream man; Aaron brought a spiritual dimension to her life she had never experienced before. But she soon found herself embroiled in a battle of good and evil that shook her to the core and forced her to find the nugget of truth she desperately needed to survive. Based on the author’s life, this novel flings you across continents and into unseen worlds as Noelle stumbles to discover the meaning of life, and to her surprise, finds it where she least expects it.